William Wells lives and works at what may be the nation’s most remote weather station. It’s 300 miles off the west coast of Alaska (and 500 miles off the east coast of Siberia) in the Bering Sea. Even by St. Paul Island standards, his station is remote: it’s off by itself, a few miles away from the village of 400 people who call St. Paul home. 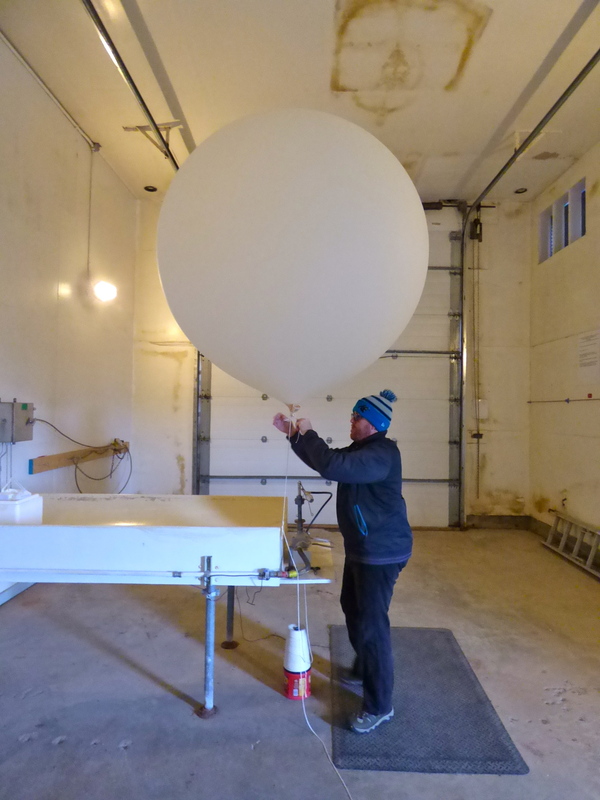 Each afternoon, he walks from his office into a two-story-tall garage to fill up a six-foot-wide balloon with hydrogen gas. “But we’re no under threat right now because it’s contained safely within that latex,” he assures me. Helium would be safer but more expensive, especially with shipping to the middle of the Bering Sea. So the St. Paul National Weather Service station generates its own hydrogen on site. 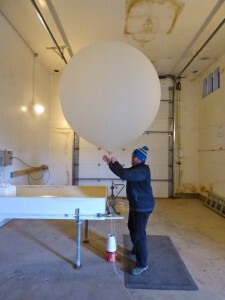 Once the big latex balloon is inflated, Wells takes a string and ties a small gadget known as a “radiosonde” to the balloon. “It tracks the temperature, relative humidity, and wind speed and wind direction as it goes up through the atmosphere,” Wells says. He pulls on a heavy chain to open the double-tall garage door. Then he grabs the balloon’s string in one hand and checks his watch with the other. When the clock strikes three, he sprints out the door in a mad dash: across a patch of tundra toward the gravel road in front of the station. As the balloon above him clears the high garage door, a 30-knot wind whips it hard to the east. The wind that strafes low, treeless St. Paul Island pummels the balloon into a shape basically like a 3-D comma. Wells needs to get far enough away from the weather station’s buildings that the wind doesn’t plow the balloon or its electronics into the side of one of them. Once he reaches the road, he releases the balloon, and it shoots away. In this wind, the balloon takes off more like an airplane than a balloon. Wells returns to the garage and quickly closes it up. “Now, I’m going to apologize, but I’m going to take off almost at a full-bore sprint,” he says before doing just that. 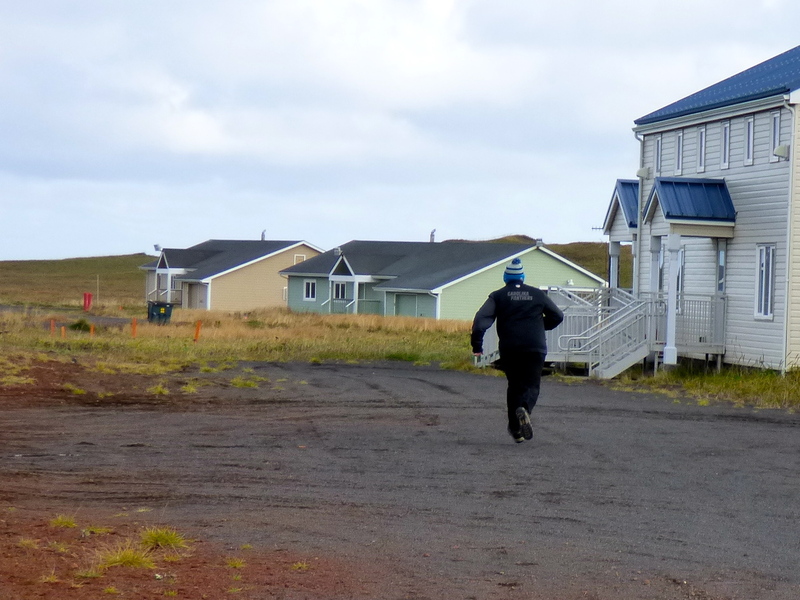 He sprints the 100 yards back to his office to make sure the radiosonde is transmitting data in real time. It is. No need for a second launch today. It’s a daily routine for Wells. For the balloon, it’s a one-time affair. As it rises 20 miles into the sky, it swells to about 40 feet in diameter. Then it bursts and returns to Earth as debris, most likely somewhere in the Bering Sea. But not before it has sent back valuable data. Twice a day, like clockwork, balloons are released from hundreds of locations around the world at noon and midnight Universal Time (3:00 p.m. and 3:00 a.m. Alaska Daylight Time). Before they burst in the upper atmosphere, they help weather forecasters pinpoint what’s going on overhead. In a report on the impacts of released balloons, marine biologist Jan van Franeker with Wageningen University in the Netherlands says, even if made of natural latex, they are a danger to wildlife, especially seabirds. 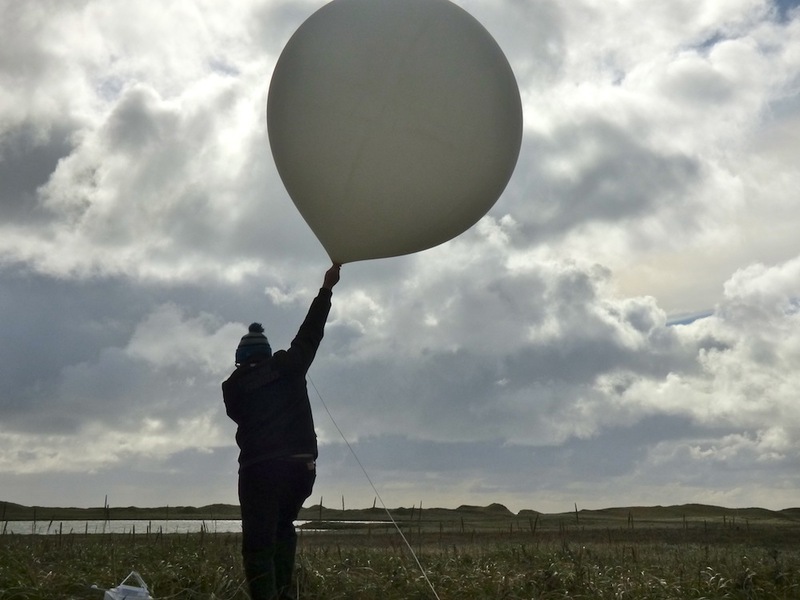 He says remains of weather balloons can be found regularly on European beaches. 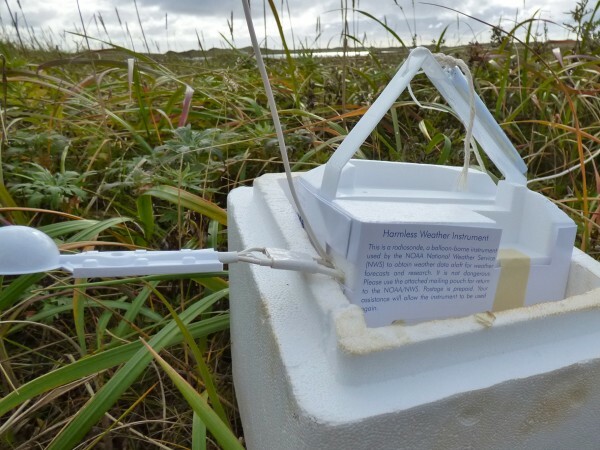 Each National Weather Service radiosonde includes a self-addressed envelope encouraging anyone who finds it to mail the gadget back for reuse. The St. Paul weather station has been collecting data since 1915. It’s been successfully sending balloons into the sky, in winds up to 50 miles per hour, since 1948. Wells says he’s always loved the weather, especially the meat and potatoes of gathering the raw information needed to make a forecast. “It takes a lot of skill and hardiness to do it, and I’m proud to do it,” he says. 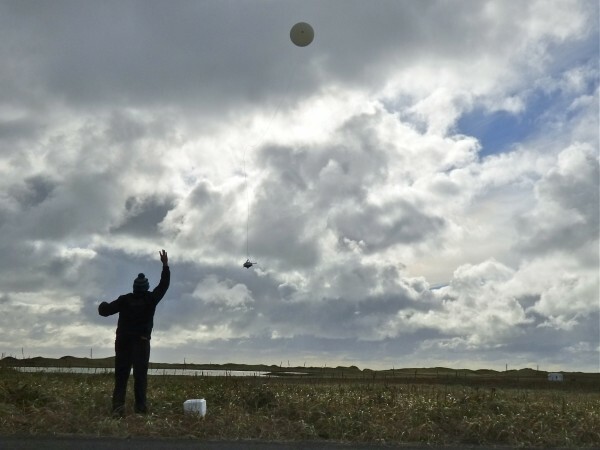 The National Weather Service is testing an automatic balloon-launching device at its station in Kodiak in November. Some day, human launchers like Wells could be replaced by machines at the 13 weather stations in Alaska and those across the country. For now, Wells is a continent–and 300 miles of Bering Sea–away from his native North Carolina, but he doesn’t mind. Some St. Paul residents dislike it when their home is described as “the middle of nowhere.” And in some ways, the Pribilof Islands are centrally located: St. Paul is home to the world’s largest Aleut community; Trident Seafoods claims to run the world’s largest crab-processing plant there. Nearly half of all seafood harvested in the United States is hauled up from the Bering Sea. Still, travel to St. Paul from almost anywhere else (it’s a three-hour, thrice-weekly flight from Anchorage on planes so small they ask you what you weigh before assigning you a seat), and you realize that St. Paul is on the distant outer perimeter of the Last Frontier. Wells says his quiet life on the outskirts of St. Paul, on the outskirts of America, is lacking in some creature comforts, but it’s been good for him. “I lost 25 pounds after moving up here because I didn’t have the temptations of fast-food restaurants about me,” he says. It’s a different career path than his classmates who get dressed up and made up and sweep their arms in front of maps on TV news. Jobs like his make their forecasts possible.